My all time favorite Christmas treats are chocolate covered Cherries. Each year, this is something that my husband buys me treat, and he also started including cookies and cream bonbons. A double delight! There is nothing quite like biting into a chocolate covered cherry. The ooey gooey center is so rich and pairs beautifully with the chocolate coating. This recipe gives details for both white and dark chocolate versions of this traditional holiday goodie. Both of these are quite easy to make, so you can have them during the year as well as during the holiday season. In a large bowl, combine butter and milk. Gradually beat in confectioners’ sugar until a smooth dough is formed. Divide in half; cover with plastic wrap. For bonbons, stir cookie crumbs into one portion of dough. Shape into 1-in. balls. Dip into white candy coating; allow excess to drip off. Place on waxed paper-lined baking sheets. Chill until firm. For chocolate-covered cherries, shape remaining portion of dough into 1-in. balls; flatten to 2-in. circles. Wrap each circle around a cherry and gently reshape into a ball. Dip into milk chocolate coating; allow excess to drip off. Place on waxed paper-lined baking sheets. Chill until firm. Store in an airtight container. Yield: 9 dozen. 125 calories each piece. What are your favorite holiday treats? 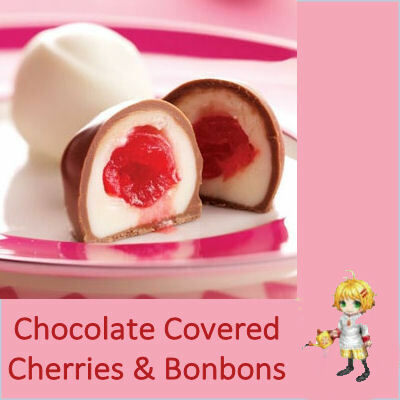 Are you fond of chocolate covered cherries as I am? For more great holiday treat ideas, be sure to visit my Pinterest Christmas board. These candy treats are easy to make at home and super tasty. For chocolate-covered cherries, shape remaining portion of dough into 1-in. balls; flatten to 2-in. circles. Wrap each circle around a cherry and gently reshape into a ball. Dip into milk chocolate coating; allow excess to drip off. Place on waxed paper-lined baking sheets. Chill until firm. Store in an airtight container. Yield: 9 dozen. 125 calories each piece. ← Tulips Daffodils and the Front Garden Bed.